My name is Ana Moreno. 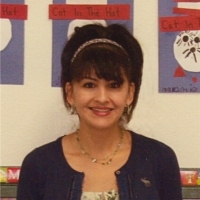 I have been working at Sloan Canyon Preschool since 2013. In addition to my experience with my own children, Aaron, Lelia and Logan; I have over 20 years experience working with children. After graduating from high school, I attended college with the goal of becoming a psychologist. However, my goals changed many classes later while working as a teacher’s assistant in the L.A. Unified School District. I then realized that my heart was set on working with children. I was very fortunate to have worked with all grade levels including K-6. I worked at Laurel Hall in North Hollywood and when I moved to Castaic, I was very blessed to have found Sloan Canyon Preschool. I have a great love and passion for working with children and I can hardly wait to share fun, loving and great experiences with you child. It is always exciting to watch them grown both academically and spiritually.